It was the vehemence of the assault that surprised me. The attacker: my son. His weapon: my birthday cake. My birthday was last week. With Maria in our family now, I knew this year would be different than the usual last-minute birthday cards. Birthday celebrations in Guatemala have unique traditions, which I learned about one afternoon during a front yard soccer game a few days before my husband’s birthday. Maria, who had joined our family two weeks earlier, called me over and whispered in Spanish, “I have an idea for Christopher’s birthday. I’ll wake up at 4 a.m….” Wow, I thought, is she going to prepare a feast for when he awakes two hours later? She’s amazing! “And I’ll wake up the boys at 4 a.m.,” she continued, “and we’ll come into your room at 4 a.m. and sing songs and pour ice water on him!” Her face was overtaken by a huge smile. Which I had to snuff out, even if it was culturally insensitive. “No. No way. Do NOT do that. He will not like that.” She took the note, and instead made a huge, colorful birthday banner, taped to the dining room wall after he went to bed. Lovely. Two weeks later, we celebrated my older son’s birthday in a similar way. No middle of the night birthday anarchy. I had protected them from this particular cultural exchange. Cue my birthday. I had seen hints that Maria and the boys were at work on an art project, heard giggling and whispers, and was happy the three of them were getting along so well. On the morning of my birthday, I woke up to the sounds of them scampering about. I felt content, not only because I knew there was something special planned for me, but because this experiment of welcoming a stranger into our family was succeeding beyond my wildest dreams. I had never expected my boys to come to love Maria, nor so quickly. At 6:30 a.m. Maria and the boys entered our bedroom. Aaron held a beautiful cake that read “Happy Birthday Laura” in flowing red icing script, and candle flames lit the dark bedroom. Maria held an iPad playing “Happy Birthday” in mariachi style. Emmett held a camera, recording the moment. I felt loved and appreciated. I made my wish, and then I blew out my candles. 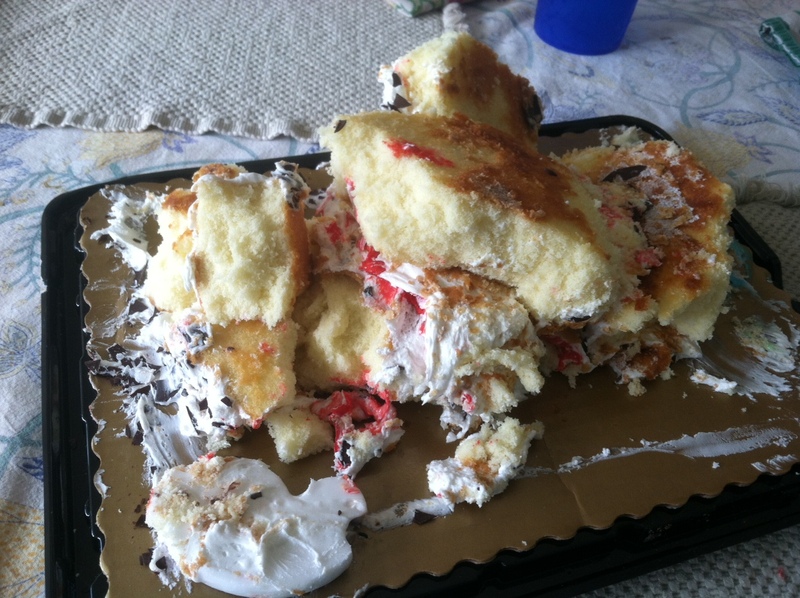 Before I could inhale my next breath, I was inhaling my cake and my son’s fist behind it. He pushed the entire quarter-sheet cake up onto my chest and chin. That was their plan. Ha ha ha. Feliz cumpleanos. But my 14-year-old kept going. He grabbed the cake and shoved it at my head. Cake flew everywhere: on me, my pillow, the bed, the floor, the rug. When he finally stopped, the cake was destroyed. I was crestfallen. Either he had misunderstood Maria’s instructions and innocently taken it too far, or he had become overcome by aggression over every fight about too much screentime. It felt like the latter — “Does he hate me that much?” I wondered. I tried not to cry. The kids sort of helped Christopher clean up. I got in the shower. Though I tried not to let it, it colored the rest of my day, a charcoal hue that came with me on a hike underneath otherwise blue skies. I tried to shake it off. By day’s end, we had moved on, and eaten the entire cake. A few days have passed, and I’ve recovered from the hurt feelings. I still don’t know if the intensity of the cake attack was motivated by suppressed anger, or the thrill of permission to run amok. I look for a lesson regardless, something to salvage. Perhaps it is this: I have entered the era of Mother to an Adolescent. There will be friction and misunderstandings, disagreements and disputes. But at the end of the day, we come together. We share the ample sweetness there is, in all its delicious imperfection. I made it clear that it went too far, but I did not want to further deteriorate the mood with a reprimand and fight. He apologized-ish. And said he was only doing what he was told to do. I think the message was clear: next year will be different. oh Laura…I apologize for saying this, but this just made me laugh so hard…at your expense! Sorry, but the picture of the cake was just too much! I hope you you have a wonderful birthday year!!! You deserve it!! Laughing so hard is the only option!